Please download and bring these forms filled out for your first office visit. IF YOU ARE UNAMBULATORY OR NEED ASSISTANCE TO TRANSFER TO AND FROM BED, YOU WILL NEED TO BE ACCOMPANIED BY FAMILY MEMBER/FRIEND WHO HELPS YOU IN THOSE FUNCTIONS AT HOME. THIS PERSON WILL HAVE TO SPEND THE NIGHT WITH YOU IN THE LAB. YOUR APPOINTMENT WILL BE CANCELLED AFTER ARRIVAL TO THE LAB BY THE TECHNICIAN IF THIS REQUIREMENT IS NOT MET. 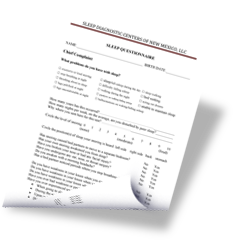 Please download and bring these forms filled out for your sleep study. We look forward to helping you get a great night's sleep!